Unlike ABC and Roseanne, he doubt the EU will cancel the "Oettinger Show" as yet another unelected bureaucrat is allowed to slide after exposing the truth about what democracy really means to Europe: keep voting until you get the outcome we want. 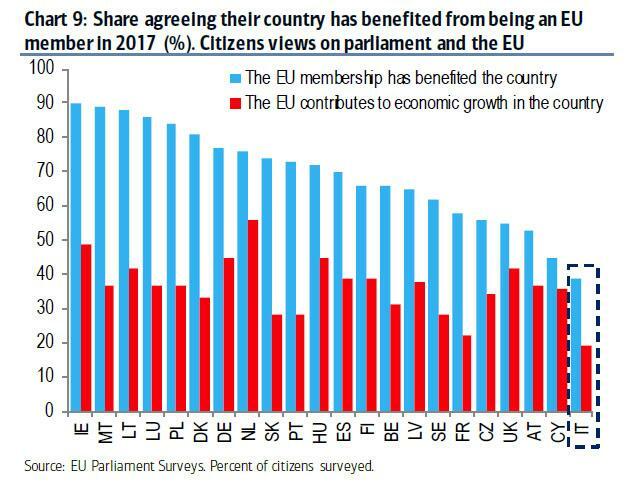 When it comes to Italy, unlike most other insolvent European nations which at least have an passing ideological affinity toward the EU and the common currency project, the Italian population has been growing increasingly disenchanted and belligerent over the years toward the EU, and as shown in the BofA chart below, Italians score the lowest when answering if "EU membership has benefited the country" or if "the EU contributes to economic growth in the country." Between the growing animosity toward Europe, and the recent political chaos in Rome, where the country's president - under implicit orders from Europe - blocked the formation of a democratically-elected parliament just because he didn't like the Euroskeptic finance minister, one would think that Europe would keep a lower profile and certainly not say any words out of place that may further infuriate the Italians, who are not set to vote not only in a repeat round of national elections, but what is shaping up to be a nationwide referendum on the euro. The Italian reaction was fast and furious, with the anti-establishment 5-Star Movement and anti-migrant Euroskeptic League both blasting Oettinger for bringing up Italy's painful past, when the ECB's indirect intervention in Italian markets prompted the resignation of Berlusconi back in 2011, with his suggestion - which while 100% accurate makes a mockery of the one thing that nobody dares to talk about, that there is no democracy in the EU - that markets would persuade Italians not to vote for the two populist parties. The head of 5-Star's European Parliament delegation, Laura Agea, said "we ask European Commission President Jean-Claude Juncker to immediately deny Commissioner Oettinger. Quoted by Ansa, she said "his words are of an unprecedented gravity and are proof of the clear manipulations that Italian democracy has suffered in the last few days". League leader Matteo Salvini pounced: "They are without shame in Brussels. "The European budget commissioner, Germany's (Guenther) Oettinger, says that 'the markets will teach Italians to vote for the right thing'. If that isn't a threat...I'm not scared #Italiansfirst". Indicating just how tone deaf Europe is vis-a-vis Italy's populist anger, even a spokesperson for the supreme bureaucrat himself, European Commission President Jean-Claude Juncker, said that Oettinger's remark was "ill-considered." "Juncker has been informed of this ill-considered comment, and has asked me to clarify the Commission's official position: it is up to the Italians and only them to decide the future of their country, and to no one else". Others also scrambling to do damage control, as European Council President Donald Tusk also appealed to European institutions to respect Italian voters after Oettinger's remarks, saying "my appeal to all European institutions is please, respect the voters: we are here to serve them, not to lecture them". By this point it was, however, too late and Italy's anger and disgust with Europe not only just hit an all time high, but likely assured that the upcoming "euro referendum" election will be a landslide. And speaking of said election, according to Italy's LA7 TV channel, Italian parties are now considering to hold the vote on either July 29 or August 5. And there goes every European's 4-6 week summer vacation.